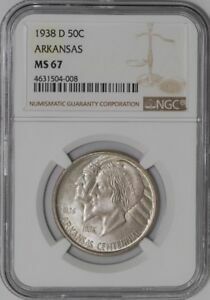 The Arkansas half dollar is a good example of a worthy project discredited through greed and poor management. Although this issue was the product of a state-sanctioned committee, this group's actions were more in character for racketeers. That the design of this coin was something less than an artistic success only added to the controversy. 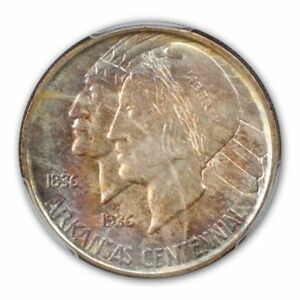 Still, time has a way of healing old wounds, and coin collectors today seek the halves of this type as avidly as any others in the U. S. commemorative series. The 100th anniversary of Arkansas' statehood called for a number of celebrations, the grandest of which was scheduled for 1936 at the state capital of Little Rock. 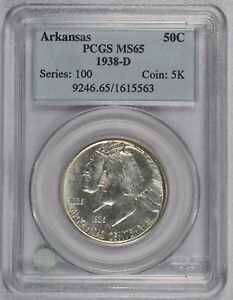 Noting the success of other states in funding such events through the sale of commemorative coins, a similar plan was devised by a state-appointed group calling itself the Arkansas Honorary Centennial Celebration Commission; this name was later shortened to the Arkansas Centennial Commission. 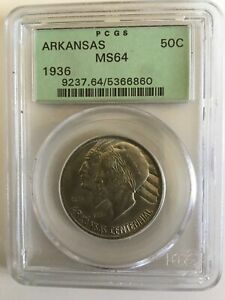 Acting promptly, the Commission got its bill passed by Congress May 14, 1934, authorizing the coinage of 500,000 half dollars honoring Arkansas' statehood centennial. The review process was no doubt eased by the fact that Arkansas' Joseph T. Robinson was Senate Majority Leader and, until his death in 1937, the most influential figure in Congress. Robinson would later be recognized (against his own wishes) with an additional authorization of Arkansas halves featuring his portrait. These, however, are collected as a separate issue. 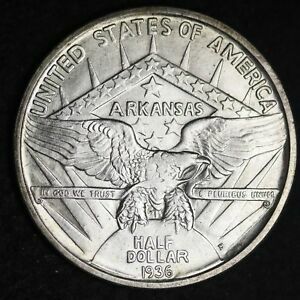 The language of the Arkansas bill conveniently omitted any reference to a place or date of coinage, yet it specified that the coins were to be delivered only to the Commission or its designated agent "at such times as they shall be requested." 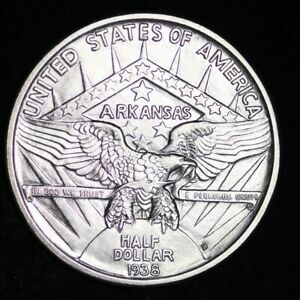 With so generous an authorization, the Commission could and did request that Arkansas halves be coined at all three mints and in several consecutive years. 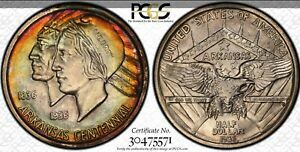 If this was not enough to aggravate collectors (who naturally sought completeness in their sets), the Commission's clumsy and sometimes suspect handling of distribution further fueled the fires of resentment surrounding this and other "serial" commemoratives. Before marketing the Arkansas half, however, there was the matter of designing it. This too was engulfed in controversy, as the original sketches by Little Rock artist Edward Everett Burr were soundly rejected by the Commission of Fine Arts at its meeting of July 26, 1934. Disapproved "because of unsuitability for a coin of the United States," a recommendation was made that entirely new sketches be submitted. This began an exchange of letters between the Fine Arts Commission and various individuals associated with the Arkansas Centennial Commission in which the former implied that another artist should be sought. Furthermore, it was the view of the Fine Arts Commission that the sculptor engaged to transform Burr's sketches into finished models, Emily Bates of Chicago, was likewise unqualified. 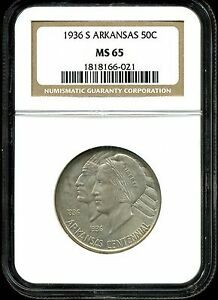 Although numerous detailed suggestions were furnished by sculptor Lee Lawrie of the Fine Arts Commission, the Bates models did indeed fall short of what was needed to produce a finished coin. Despite the Commission's recommendation that both designer and sculptor be replaced, by March of 1935 the models were sufficiently improved that they were passed by the Fine Arts Commission and forwarded to Medallic Art Company of New York for reduction to hubs. 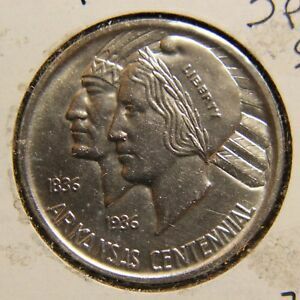 The obverse of the Arkansas Centennial half dollar displays conjoined busts of a Quapaw Indian and Miss Liberty. The chief wears a broad, feathered headdress, while the young lady is adorned with a Phrygian cap inscribed LIBERTY and a wreath of what appears to be wheat. 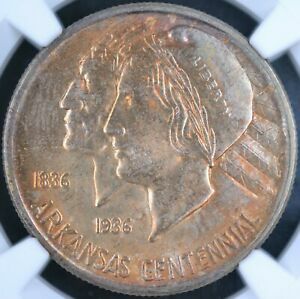 The words ARKANSAS CENTENNIAL are arranged in an arc around the lower periphery, while the dates 1836 and 1936 are staggered within the field. The reverse symbology, as explained by Burr, is too complex to detail here, but it's alleged to contain references to the Confederacy. The central device is a facing eagle perched upon a rising sun, the rays of which are behind the bird. This eagle holds in its beak a banner inscribed IN GOD WE TRUST at left and E PLURIBUS UNUM at right. Behind it is a parallelogram bearing 13 stars, while another four are within. The name ARKANSAS also appears within this geometry. 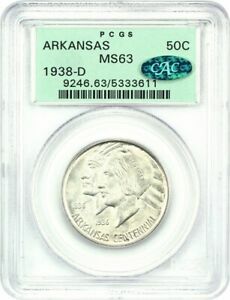 UNITED STATES OF AMERICA is above in a peripheral arc, while HALF DOLLAR and the date of coinage appear on the disc of the sun. The mintmark, if any, is at the base of the rightmost ray. 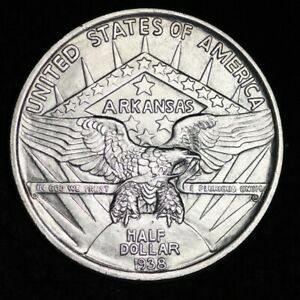 A total of 10,008 Arkansas halves were coined at the Philadelphia Mint in May of 1935, a year before the actual centennial. (The odd eight coins, as with similar such figures for other dates, represent pieces withheld for assay and later destroyed). The first 10,000 halves sold quite well, and another 3,000 were ordered later in the year. On the advice of prominent coin dealer B. Max Mehl, small mintages were ordered from the Denver and San Francisco Mints, some 5,505 and 5,506, respectively. 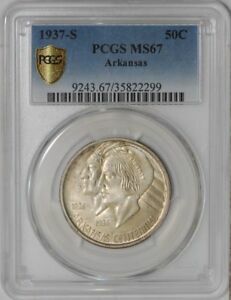 Like the Philadelphia Mint coins, these were offered by the Arkansas Centennial Commission at just $1. Most persons ordering them, however, were told that no more were available. All, or nearly all, had secretly been sold in advance to Mehl, who then retailed them at $2.75 apiece. Subsequent issues, offered annually through 1939, were subject to the same unfair manipulations at ever-higher mark-ups. Such practices ultimately brought down the wrath of Congress. 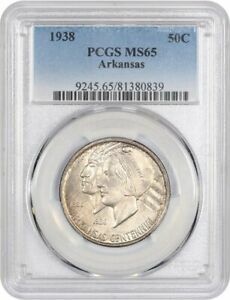 It passed a law on August 5, 1939, terminating the re-issue of all previously-authorized commemoratives. 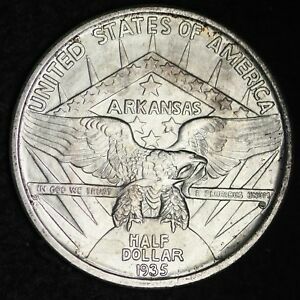 Already burdened with an unimaginative design, the typical Arkansas half is further handicapped by poor luster and incomplete striking. 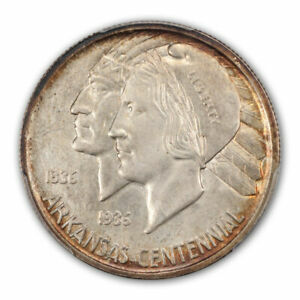 The surfaces of these coins usually have a subdued, satiny luster which is described by some as "greasy." 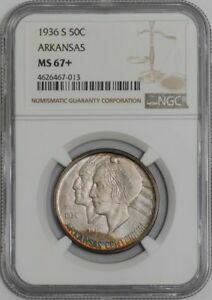 The central portion of either side may be weakly struck, revealing rough spots in the planchet that should have been smoothed by the dies. In addition, the exposed face of Liberty is particularly susceptible to contact marks. For these reasons, true gems of the Arkansas type are scarce. 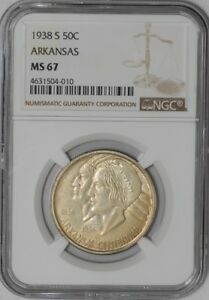 Most coins grade MS-60 through MS-64, although a fair number have been certified MS-65. Higher grades are far fewer in number. Since most Arkansas halves were sold to coin collectors, they are rarely encountered worn. The most frequent exceptions are the 1935 and 1936 issues from the Philadelphia Mint. These were sold to the general public, as well, and they were sometimes spent or carried as pocket pieces. Points to check for wear include Liberty's cheek and wreath, also the eagle's head and right wing. Several types of packaging were employed for this series. Most commonly seen is the generic, unprinted holder made by Dennison, having holes for up to five coins. The 1937 sets were distributed by Stack's of New York in attractive, black velvet, rectangular cases. For the 1938 sets (distributed in part by Stack's), these cases were used again, along with another covered in tan, wood-grained paper with either black or green velour inside. 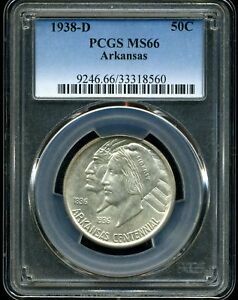 The Mint's Chief Engraver, John R. Sinnock, had three-coin sets of matte proofs made for each year of the Arkansas type. These have extremely sharp details and a dull, etched finish.